Proving why she is one of the most highly-regarded auteurs of current cinema, Kelly Reichardt's (OLD JOY) subtle storytelling technique uses a formal minimalist style to weave together a unique emotional and political road film. Wendy Carroll (Michelle Williams) is driving to Ketchikan, Alaska, in hopes of a summer of lucrative work at the Northwestern Fish cannery, and the start of a new life with her dog, Lucy. When her car breaks down in Oregon, however, the thin fabric of her financial situation comes apart, and she confronts a series of increasingly dire economic decisions, with far-ranging repercussions for herself and Lucy. 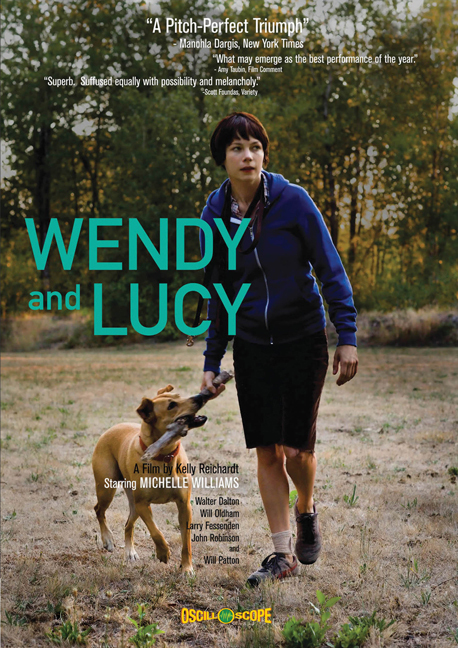 WENDY AND LUCY addresses issues of sympathy and generosity at the edges of American life, revealing the limits and depths of people's duty to each other in tough times. Based on the short story "TRAIN CHOIR" by Jon Raymond. American landscapes and narratives of the road are themes that run throughout Reichardt's work. Reichardt's film "Old Joy," winner of a Tiger Award at the 2007 Rotterdam Festival, is a New Age Western and exploration of contemporary liberal masculinity in the Great Northwest. Reichardt's first feature, "River of Grass," a sun-drenched film noir shot in her hometown in Dade County, Florida, was cited as "one of the best films of 1995" by The Village Voice and Film Comment. Her 1999 short, "Ode," is a super-8 reinterpretation of the Herman Raucher novel "Ode to Billy Joe" and features an original soundtrack by Will Oldham. Reichardt's other super-8 shorts include "Then a Year" (2002) and "Travis" (2004). Kelly Reichardt is currently a Visiting Assistant Professor at Bard College.